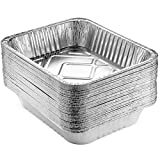 Disposable barbecue grills are usually foil trays containing charcoal and a lighting sheet (paper or other material impregnated with a flammable fluid), and topped with a foil grill. The idea is that you can simply light the sheet, wait for the flames to die down, and then barbecue your food on the top of it. When the barbecue is finished and the grill has cooled down, you can then throw the whole thing away. Disposable barbecue grills often are surrounded by quite a lot of packaging material. For example, the ones that I have purchased have come in a cardboard box or tray, with paper signs on top, and wrapped in cellophane. You must be sure to remove all of the packaging before using the grill! My experience is that these grills work much better when it's not too windy - even modest wind can cause problems. When carrying the box, the charcoal can easily pile up at one end of the grill. Before lighting the grill, shake the grill gently to ensure the charcoal is even spread out across the grill. Disposable grills usually come with instructions - read them carefully - as there can be important safety issues. Additionally, for those disposable grills that I have used, I've generally found the instructions will tell you to wait until the initial flames die down before placing food on the grill, and this does seem to be advice worth following. Perfect for Picnic, Party and Camping - Enjoy It! Disposable Grill Lasts Up To One and a Half (1.5) Hour , Ready To Use - EZ to Light - Lights With One Match, All Natrural Charcoal - Kosher (Passover) Badatz Jerusalem INSTRUCTIONS NOTES: 1) Remove the Product from its package, And place it on the supplied frame, in a stable manner on an horizontal surface, which is resistance to heat and fire. 2) Between the BBQ grating and the coal, there is a thick sheet saturated with coal igniter, place a lighted match in one of the grating's boles to set alight the coal igniter, which will catch fire and cause the fire to spread to the whole surface area. 3) Wait for a few minutes until the flames subside and the coal glows throughout the surface area. CAUTIONARY NOTES: 1) Keep out of reach of children! 2) Supervised the product fire throughout its period of use. 3) Do not use the product in enclosed spaces, under dry branches or in proximity of flammable material. 4) The product must be used on a surface which is not affected by the heat of the coal, such as: Sand, Gravel, or Stone surfaces. 5) After using the product completely extinguish the coal with water, and then dispose the product in a waste disposable facility litter bin. NOW THE MINI BARBECUE IS READY FOR USE. ENJOY IT!  VERSATILE COOKING AND BAKING LASAGNA TRAYS SET WITH EVEN COOKING - They make the perfect grill drip tray and have even heat distribution ensuring all your food is the same temperature. Great for Table Chafing, baking, roasting, broiling, picnics, tailgates and more!  RECYCLABLE | TOSS OUT WHEN DONE OR HAND WASH - When you are done serving your hot or cold meals, conveniently throw the steam pans in the recycling bin for a quick and easy clean up. If you'd like to reuse them, they'll look good as new hand washed with soap and water. Serve your amazingly cooked or baked meals with convenience - no more cleanup hassle! Proudly Made in the USA for Superior Craftsmanship! Our ultra-durable aluminum containers are designed for professional cooks and caterers as well as the at-home cook. You can fill these pans up to the brim with food and they won't budge an inch! You won't have to worry about them bending or folding up while you're transporting your food. Have Your Meals Cooked Evenly from Side to Side! They provide even heat distribution, so all your food is the same temperature with no random burned or undercooked pieces. Eco-Friendly ♻ Help Keep the Environment Clean! When you're done with them you can simply throw them away. They're recyclable so you'll be doing your part in helping the environment. If you'd like to reuse them they can be easily hand washed. Many of our customers get YEARS of use out of our superior pans. Going Camping or Having a Cookout? Pack your foods in these trays for a camping trip or day and the beach or lake. If you're having a cookout in your backyard you can toss all the delicious food, you grill up in these trays and serve them up to your guests.  This money-saving value pack comes with 30 Aluminum Foil Pans! We want to not only deliver the highest-quality products but make them affordable and save you some money! You won't find a better deal for versatile disposable aluminum trays than what we're offering... GUARANTEED. Choose to Buy them now and see for yourself the difference in quality!